What sorts of jobs does our Network have? Regular commitment or just passing by? Many of our network volunteers don't even know they are volunteers! But they pitch in freely and get their tasks done but do get paid with the happiness of knowing a job's well done with that brew at the end. And all in the company of people with whom they already have or will soon become strong friends, jointly ensuring a natural environment remains for our flora and fauna in the future..
We also get satisfaction through our close relationship with the staff and management of our local councils. They provide the material and human resources that enable us to achieve our joint targets. But they also provide guidance and training through their professional staff who work with our group leaders as coordinators. They also support our Catchment networks with forums, workshops, field days, funding and projects. But to you, our volunteers, welcome and thanks! With your help, we'll ensure the longevity and biodiversity of our wildlife and flora doesn't get lost in all the confusion arising from competing issues such as climate change, urban and infrastructure expansion. Big ones, small ones, simple ones, peaceful ones, strenuous ones, easy ones, regular ones, "once in a blue moon" ones! We have negotiating jobs, labouring jobs, communicating jobs, planting jobs, surveying jobs, photographing jobs, planning jobs, managing jobs, facilitating jobs, workshop and forum organising jobs, cup-of-tea making jobs, Nature-loving jobs, researching jobs, writing jobs and even website management jobs. A lot of opportunities and needs just waiting for the right person to come along, look at what we're doing, and put in their contribution, skills or experience. All activities require a "sign-on" step to ensure that insurance requirements are met. Health and Safety requirements must be followed. Thus appropriate clothing is usually specified if there are particular activities envolved such as clearing and planting. Most people need to plan towards any activity. Take a regular meeting, such as say the first Saturday morning of the month for a revegetation project. The very fixing of this timing allows people to plan tasks ahead and the organisers to coordinate human and support resources to ensure the planned tasks can be achieved successfully. This also means there is plenty of time to ensure these activities are made known in advance to interested people by way of notices at each bushcare group work area, on websites operated by local councils and by this catchment network and in regular news services. We understand not everyone has lots of time to contribute. That's why most revegetation and weeding projects are organised to provide virtually all the gear, equipment and associated resources. You only need to be suitably dressed for the outdoors. For example, to have ample skin protection and sturdy footwear. Most catchment activities allow for last minute sign-on of suitably dressed volunteers though it is preferable for the activity coordinator to know in advance (even if it is mainly to ensure there's enough tea and bickies to go around!) But if any volunteer can't make it as pre-arranged because of another immediate priority, it's really just a case of a polite communication, say by mobile, or at least a followup later as apology. Not all of us can meet or even prefer to undertake regular committments. The good news is you don't have to! Kedron Brook has one of the largest catchment areas in Brisbane, comprising over 110 square kilometres of land and about 25 kilometres in length. 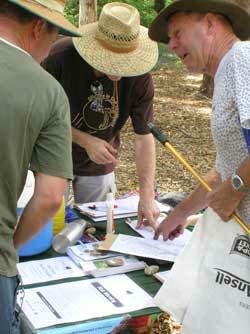 Every weekend there's sure to be a number of activities on due to the large number of Bushcare groups. Details of activities are readily available on the notice boards at relevant locations along the Brook.